Dizziness? Muscle aches? Use our symptoms finder to get more information & learn about related diseases & conditions. 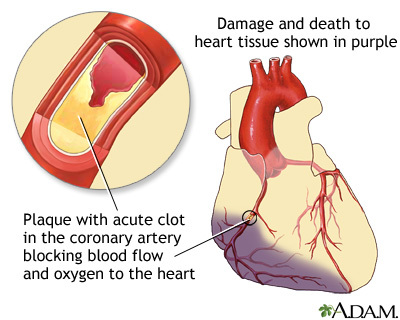 Most heart attacks are caused by a blood clot that blocks one of the coronary arteries. The coronary arteries bring blood and oxygen to the heart. If the blood flow is blocked, the heart is starved of oxygen and heart cells die. The medical term for this is myocardial infarction. A substance called plaque can build up in the walls of your coronary arteries. This plaque is made up of cholesterol and other cells. A tear in the plaque occurs. This triggers blood platelets and other substances to form a blood clot at the site that blocks most or all of the oxygen-carrying blood from flowing to a part of the heart muscle. This is the most common cause of heart attack. 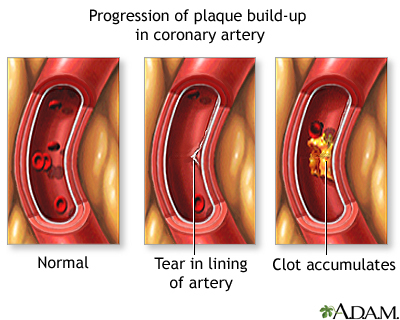 A slow buildup of plaque may narrow one of the coronary arteries so that it is almost blocked. In either case, there is not enough blood flow to the heart muscle and heart muscle dies. The cause of heart attack is not always known. Many risk factors may lead to the development of plaque buildup and a heart attack. A heart attack is a medical emergency. If you have symptoms of a heart attack, call 911 or your local emergency number right away. DO NOT try to drive yourself to the hospital. DO NOT WAIT. You are at greatest risk of sudden death in the early hours of a heart attack. 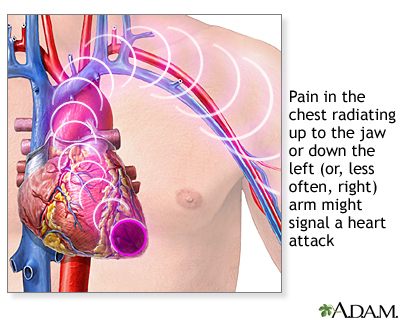 Chest pain is the most common symptom of a heart attack. The pain most often lasts longer than 20 minutes. Rest and a medicine to relax the blood vessels (called nitroglycerin) may not completely relieve the pain of a heart attack. Symptoms may also go away and come back. Some people (the older adults, people with diabetes, and women) may have little or no chest pain. Or, they may have unusual symptoms such as shortness of breath, fatigue, and weakness. A "silent heart attack" is a heart attack with no symptoms. A health care provider will perform a physical exam and listen to your chest using a stethoscope. The provider may hear abnormal sounds in your lungs (called crackles), a heart murmur, or other abnormal sounds. You may have a fast or uneven pulse. Your blood pressure may be normal, high, or low. You will have an electrocardiogram (ECG) to look for heart damage. Most of the time, certain changes on the ECG indicate you are having a heart attack. Sometimes these changes are not present, even though other tests indicate you have had a heart attack. This can be called non-ST elevation myocardial infarction (NSTEMI). A blood test can show if you have heart tissue damage. This test can confirm that you are having a heart attack. You will likely have this test 3 times over the first 6 to 12 hours. Coronary angiography may be done right away or when you are more stable. This test uses a special dye and x-rays to see how blood flows through your heart. It can help your doctor decide which treatments you need next.